I attended a wonderful design bloggers day yesterday courtesy of Boston Magazine’s “Passport To Design” program and organized by fellow blogger Yvonne Blacker. The Passport To Design event is a series of design seminars hosted by these five design industry stores and showrooms on the North Shore here in Massachusetts. The event has been going on for a couple of months, but there are still a couple of great seminars left on the schedule, so check it out. Circle Furniture in Danvers hosted the first event with coffee and breakfast and a quick showroom tour by their Merchandiser Sean William Donovan. This spacious showroom is on Rte. 1. For those who have never been there, try not to miss the showroom as it took me 18 minutes to circle back since Rte 1 is a divided highway. There is a Costco just before it on the same side, so once you see Costco, pay close attention! I wanted to sink into the tufted green chair and a half – it is fabulous! Also comes in sofa size. The tables are made from reclaimed wood and were beautiful. Next on the tour was Tile By Design in Danvers. 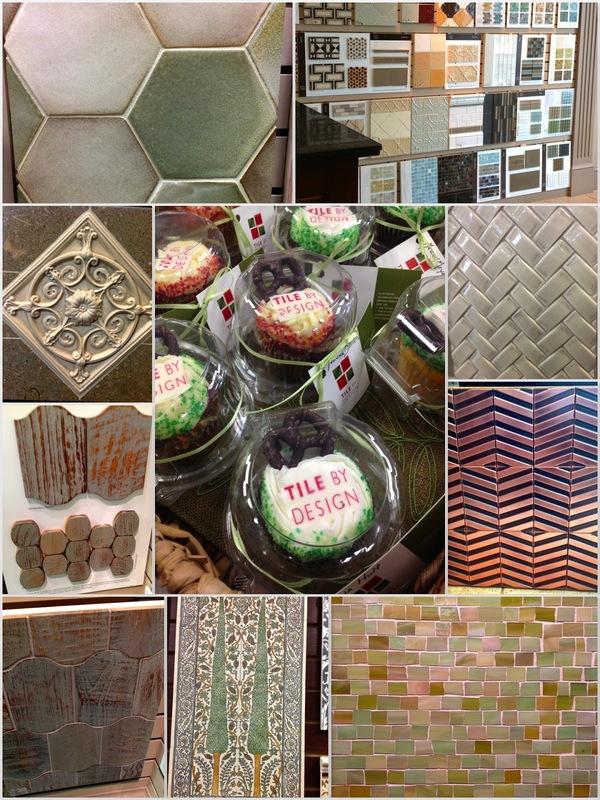 After toasting the day with Mimosas (yes, we design bloggers are a boozy lot) we toured their beautiful tile showroom that was jammed packed with hardscape goodies. My new favorite (see bottom left) is a teak wood mosaic tile that is laid like ceramic moasic tile, in sheets. It does have its own grout compound, but the look is fabulous! But since it’s wood, keep it away from fireplaces and stove tops! We were sent on our way with cute, and tasty, little cupcakes. Sweet. 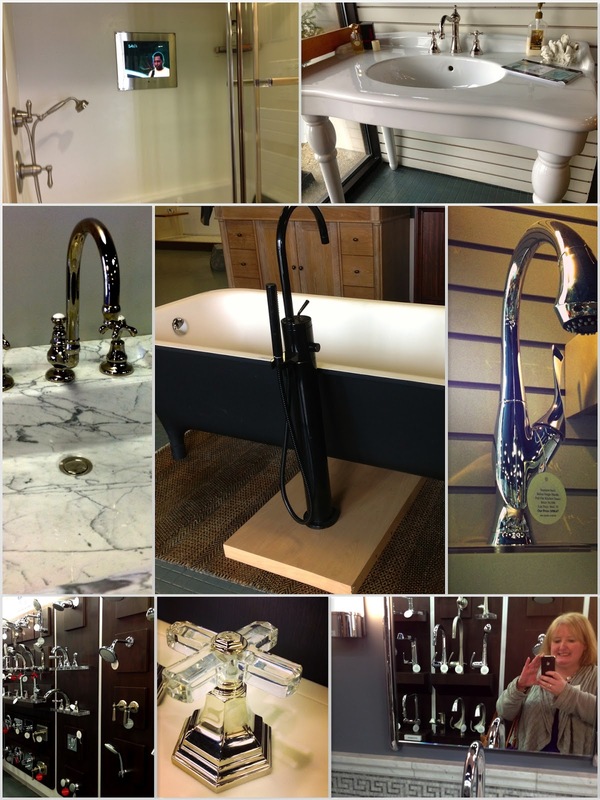 Next, we traveled to Beverly to visit the Designer Bath & Salem Plumbing Supply showroom, where our tour guide Yvonne is marketing director. They were undergoing a showroom renovation, but that didn’t dampen our spirits. (pun intended). Who doesn’t love a lot of sparkle and shine?!? Okay, question: Would you want a tv embedded in your bath or shower? See top left photo… I admit in my much younger days I used to take hours long baths (yes, fill,hot, cool, drain, refill, hot, cool, do it all over) and sometimes I did drag my little 13″ black & white tv in to the bathroom with me. But I’m not sure about having the newsman right inside the shower with me [insert joke here]. Thoughts? We had a lovely lunch of corn chowder and chicken sammies to restore our energy, tasty! And yes, that’s me bottom right – why was I grimacing?? Our next stop was the venerable Landry & Arcari‘s Salem showroom. Okay, I love carpet, love it. But unfortunately, I am allergic to wool. So being in a carpet showroom can be a bit difficult for me – the things we suffer for our art!. The L&A folks, which is a family run business, are so passionate about their rugs and it’s infectious. 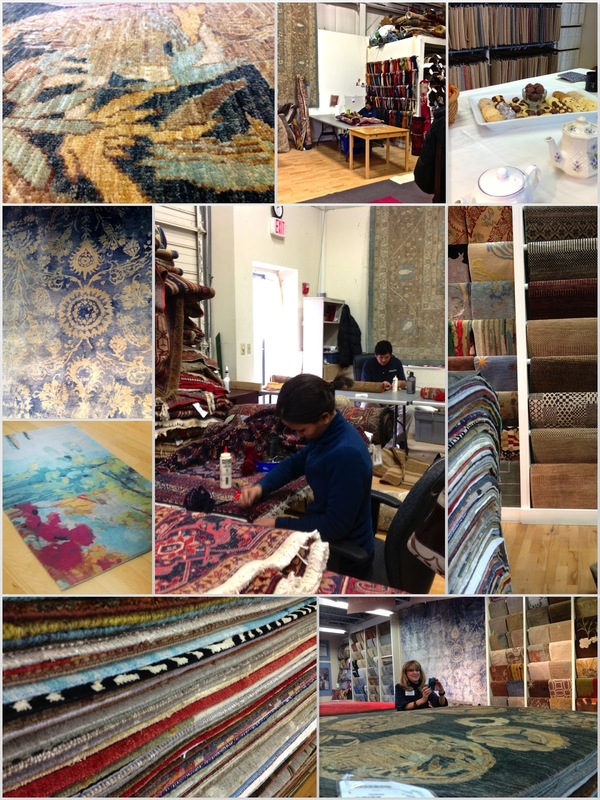 We also got to visit their workroom where craftsman/woman were busy repairing client’s rugs. Really fun to watch. I didn’t know this, and I have purchased L&A rugs for clients, that they will buy back rugs from clients. Of course, they must be in good, unstained condition, but it’s a great program. They mentioned that they had just bought a rug back from clients who purchased it 20 years ago at an excellent price. While these are not budget items, a good Oriental rug will last for decades and knowing it can be returned for a decent price if you want a change is great. Just as our energies were waning, we were treated to afternoon tea, cookies and salted caramels. Yum. A little shout out to the lovely Katherine Hawkins (bottom right). 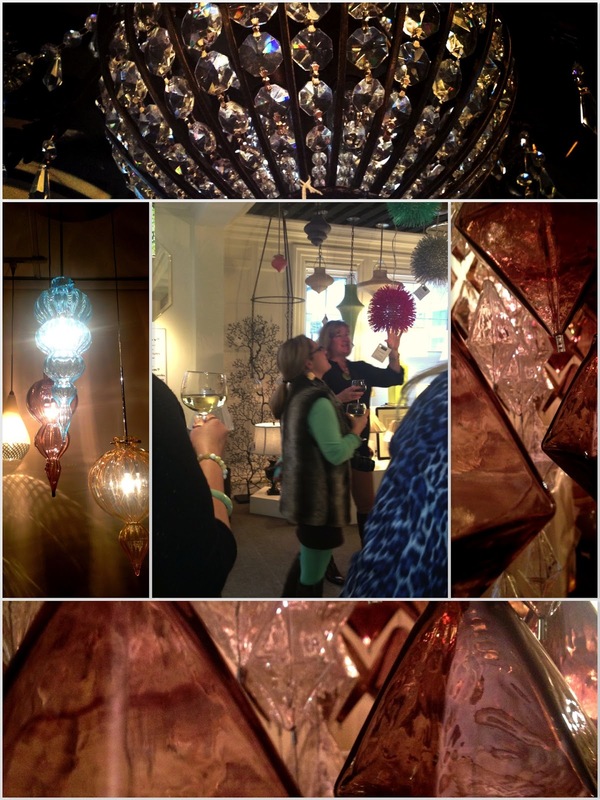 Our final stop was to the fabulous Lucia Lighting showroom in Lynn. Owner Lucy Dearborn was the perfect hostess for our final stop. As effervescent as the bubbly she generously poured upon our arrival (did I mention we’re a boozy lot? 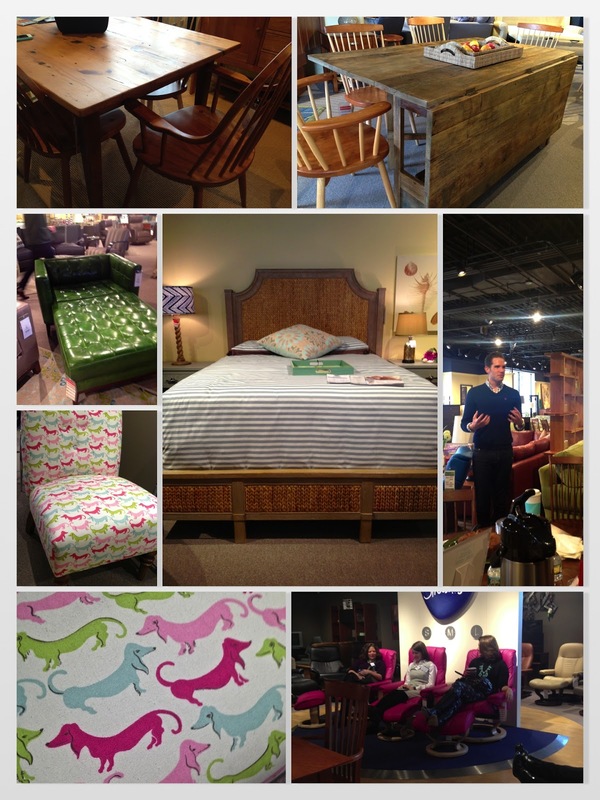 ), Lucy gave us a great tour of the showroom. That’s her in the middle image below showing us these cute little fun pendant lights that I can’t remember much about (I was pooped, I’ll admit it!). Also, shout out to fellow blog tour member Kristina Crestin. I’m more partial to crystal and sparkles. Love, love the Studio Bel Vetro blow glass lighting (bottom). The colors and patterns are amazing. Thanks for taking the tour with me. Check out the Passport to Design events still going on!